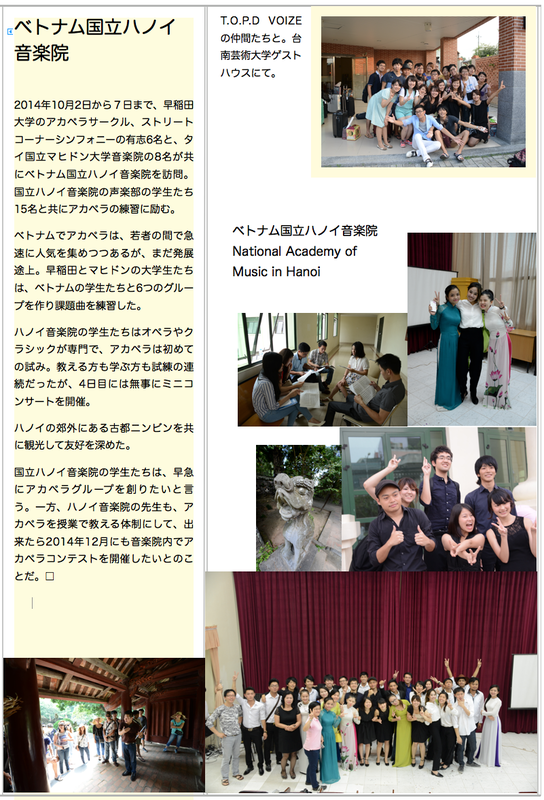 Members of Street Corner Symphony (SCS) visited Taiwan from September 15 to 22, 2014. Arriving at Taipei International Airport, the delegation headed to National Tainan University of Arts straight by a big bus. Nest two and half days we practiced A Cappella together with T.O.P.D. VOIZE, a number one students A Cappella group in Taiwan. Concert was held at a 300 seats concert hall at the university, however, full of students came to the show and all the aisles were occupied by students. T.O.P.D. VOIZE sung so well that it was a quite a challenge to Street Corner Symphony members, mostly Waseda University students. After the show we headed to Ping Tung city. Next morning Ping Tung CountySin Yi Elementary School welcomed Sing Out Asia delegation at the school. School children danced and played instruments and performed A Cappella. It was amazing and great. Next day SCS members were practicing together with high school and elementary school A Cappella Group and SURE A Cappella group. However, at 16:00 the concert was called off due to a possibility of Typhoon hitting Ping Tung at night. We had a concert for ourselves with small audience. T.O.P.D. VOIZE members from Tainan University of Art came to Ping Tung to assist SCS members. We all felt warm heartedness of Taiwan people. Waseda Street Corner Symphony members of 6 and Mahidol University Collage of Music Barista Chamber Choir of 8 visited National Academy of Music in Hanoi, Vietnam from 2 October to 7 October..
We are welcomed by 15 Vocal music department students of the Academy. For four days we practice A Cappella together. 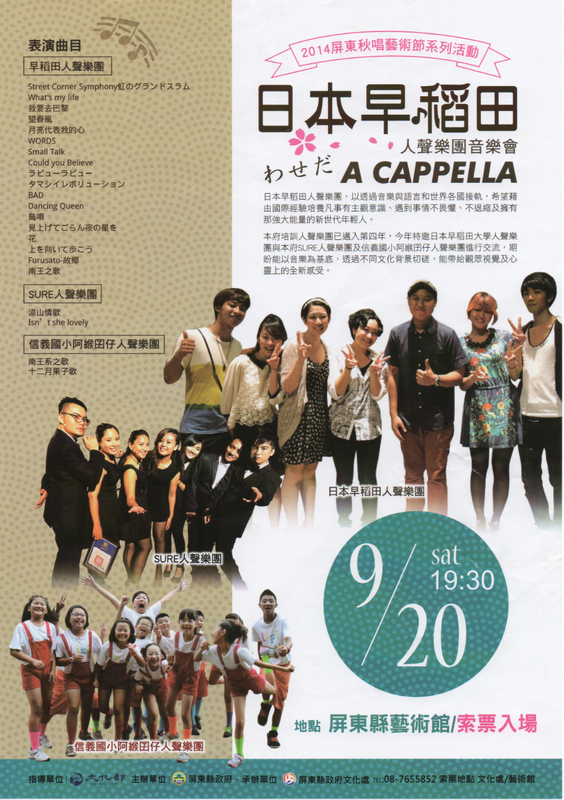 6 groups of mixed nationalities are given a theme song and practice A Cappella. For the Vietnam students, A Cappella is new and their training are in Classics and Opera singing that it was not an easy time for everyone. We visited Ninbin, an old capital of Vietnam for a day trip, all together 30 students. On 6 October we had a mini concert. It was not perfect, of course, however, it showed that everybody really worked hard. Teachers and students of National Academy of Music in Hanoi are interested in A Cappella that anything can happen in future. It was a bit short trip but every body enjoyed the time immensely. 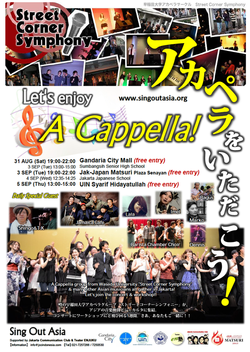 Waseda University A Cappella circle, Street Corner Symphony members and Members of Mahidol University Collage of Music got together and had seveeral A Cappella concerts in Jakarta, Indonesia. From Okinawa, Shingo & TK joined us. SOA members in Jakarta namely, Lala, Imel, Marko and Bagus performed with us. Famous Indonesian A Cappella group "Jamaica Cafe" performed with SOA at Gandaria City mall theater. Very popular groupTen2Five, a leading vocal is Imel, joined us at three places, Gandaria City, Plaza Senayan and Islamic State University. We performed at a leading high school in Jakarta, Jakarta Japanese school and the Opening gathering of Jakarta Japan Festival. 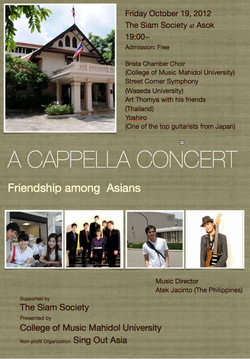 Waseda University A Cappella circle, Street Corner Symphony members and Members of Mahidol University Collage of Music got together and had an A Cappella concert in Bangkok on October 19, 2012. Venue was distinguished The SIAM Society at Asok, Bangkok, Thailand. Guitarist,Yoshiro Maehama from Okinawa and a singer song writer Art Thomya of Thailand also performed in the show. 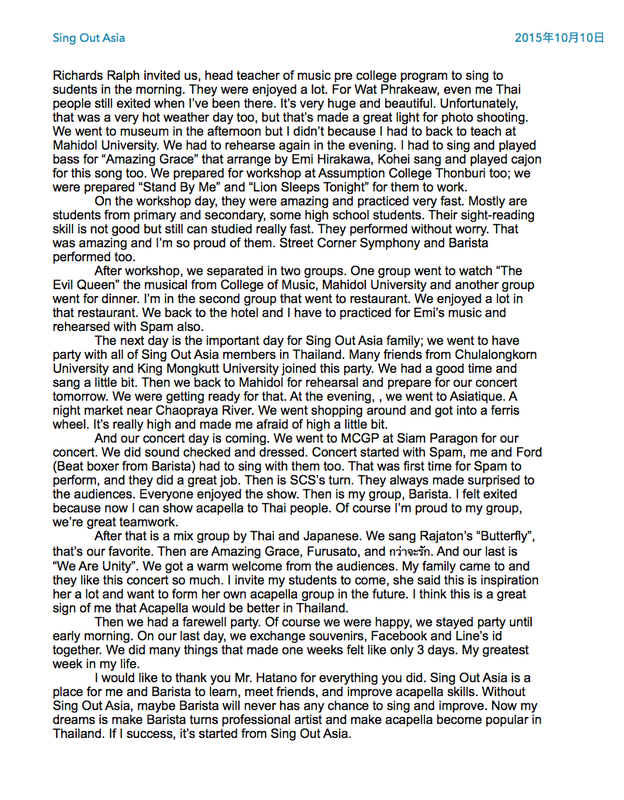 Students of both Waseda and Mahidol stayed together in a Mahidol lodging house for 5 days, and created a A Cappella show. The show was held at Tansui city park in Taipei from 18:00. Start of performance was one hour delay and there was a localized downpour. The show had to stop before the finale. 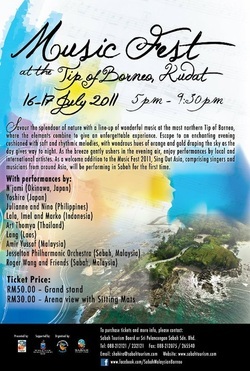 Sing Out Asia performed at Tip Of Borneo Music Fest in Saba, Malaysia on 17 July and 18 July 2011. Sing Out Asia members were Juliann, Imel, Lala, Marko, Bagus, Art, Yoshiro and N'Jami. Weather was nice and the view of the stage in front of the sea was magnificent. Darma Persada University has a strong tie to Japan. The founders of the University have once studied in Japan. The university is also strong in Japanese language education. 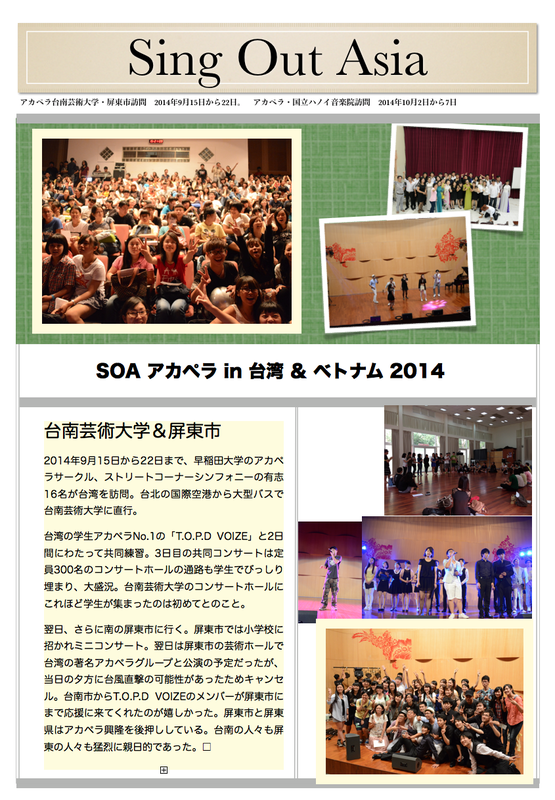 On 2 October, there were 600 students gathering at auditorium and enjoyed the performance of Sing Out Asia. Students loved the message of Sing Out Asia such as friendship, save environment, abolish all kind of discrimination and war. On 3 October, we had a party with students and enjoyed some of the Cross-Culture games. 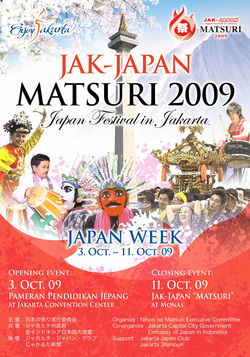 Show at Jakarta Japan Matsuri. Sing Out Asia was a main event at Jakarta Japan Matsuri. There were more than 20000 audience gathered to see the show. However, thunderstorm hit the out door stage and show was canceled. In the heavy rain more than 10,000 people waited the show to start. Sing Out Asia has many supporters in Jakarta. Sing Out Asia had three concerts in Jakarta. 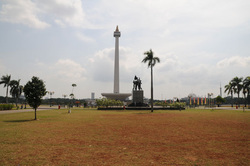 At Monas, a national park in Jakarta, "Jakarta Japan Matsuri" was held. There were 30,000 visitors to the Matsuri. When Sing Out Asia started performance under the Southern Cross, a big crowd gathered around the stage. Audience were so excited that it was hard for our members to go back to our changing room. Many young people wanted to take photo with our members. Next day, we performed twice at Usmar Ismail Hall in Jakarta. The hall is small and only can accomodate 430 people. We had total of 700 audience and they enjoyed the show greatly. For the preparation of Sing Out Asia show, we send Ms. Marie Kondo to Jakarta for a month. She was able to get support from CISV for the performance that Sing Out Asia could perform at the Usmar Ismail Hall. Ms. Sugako Kaikiri of Jakarta Communication Club and students of EN Jyuku, a student musical theater, had supported Sing Out Asia music show with full heart. Show at Okinawa. Asia South Pacific Music Fest. 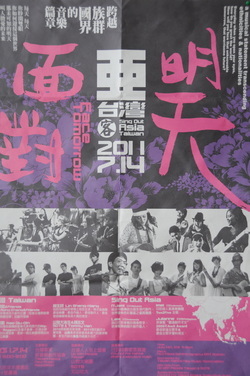 On 21 October 2010, Sing Out Asia hold a "Asia South Pacific Music Fest" in Okinawa. 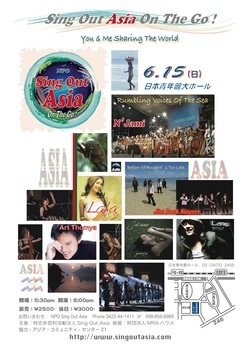 Sing Out Asia invited top musicians in Okinawa to perform with us. We have invited Imel and Marko of Indonesia for the first time. Other members were Art, Julianne, Lala, Lung and N'Jami. Unfortunately we had only 600 audiences and Sing Out Asia lost 1,300,000 yen unexpectedly. Student Union of Chulaloungkorn University had invited Sing Out Asia to perform at Chulalongkorn Auditorium. At the same time, Chengrai City government invited Sing Out Asia to a Music Festival in Chengrai City, north of Thailand. However International Airport in Bangkok was closed due to a demonstration against government that we had to cancel our show. It was a cloudy day on June 15th. We had N’Jami and Jim Rock Singers from Okinawa, Julianne from The Philippines, Lala from Indonesia, Art from Thailand, and Lang from Laos. Due to the immigration policy of Japan, It was not easy to bring the artist from South East Asia. We had Mr. Issei Koga, the Diet member of Democratic Party, to help us on this matter. June 15th, nearly 900 people showed up which almost filled up the first floor of the theater. After the show, we received heartfelt compliments from so many people. Our live show in Tokyo was made into an 8 minute special TV by Ryukyu Asahi Broadcasting of Okinawa to be on air in Okinawa & Kyushu region. We also have NHK special TV staff to interview us as a long-term project. Julianne from the Philippines took the breath of the audience with her beautiful music. She has won the most prestigious music prize in the Philippines, “The Awit Awards” in November 2008. Lala from Indonesia is singing both in the Philippines and Indonesia and very popular. David Lin of Taiwan had informed us that Sing Out Taiwn was planning to have a reunion in November 2007 and requested participation from Japan. Atek Jacinto invited an up coming singer song writer, Lala to join Sing out Asia. Sing Out Taiwan reunion was attended by 600 alumnus. They sung songs like “Open your heart” and “Shout”. Sing Out Taiwan is still active in Taiwan and three university have gropes of Sing Out Taiwan. Both N’Jami and Lala were so popular that they could not move after the show for taking pictures with students and for autographs.